Borchert Field: Were These Intended to Replace Our Beer Barrel Man? Were These Intended to Replace Our Beer Barrel Man? 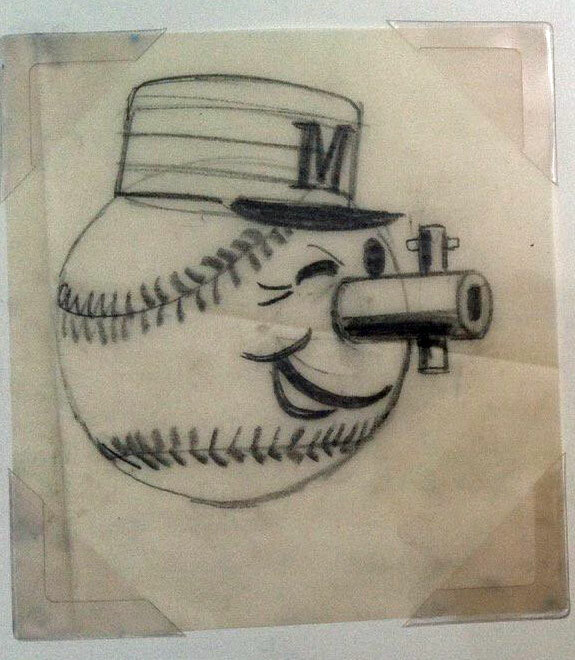 Matthew Prigge was at an antique sale and found someone’s renderings for new Brewers logos. "Perhaps these were intended for the 1977 logo design contest that resulted in the glove/ball 'mb' logo," he says. I think Matthew might be correct. They certainly have that 70's vibe to them, don't they? 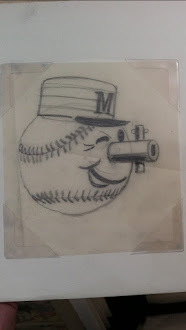 The contest he refers to was the Brewers' process for replacing the Beer Barrel Man, the descendent of our very own Owgust. 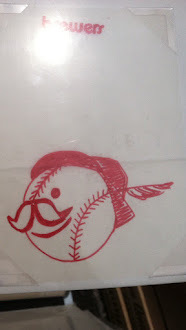 After nearly a decade of using an updated version of the American Association club's mascot, they were looking for a modern logo. Their fan-submission contest finally yielded the now-famous "ball in glove" logo. These newly-uncovered sketches don't represent the clean break we got in 1977; they're more of an evolutionary step. Let's take a look at each of them. 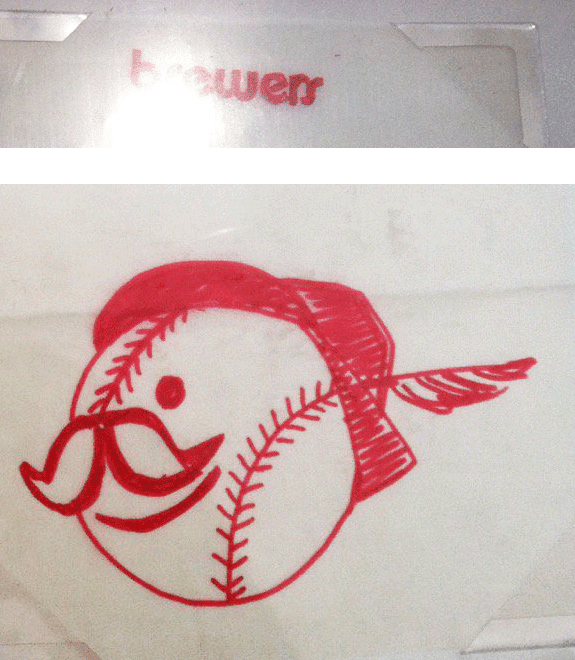 The first one anticipates the large bushy mustache of Bernie Brewer. I love the Tyrolean hat, playing on the city's German heritage. 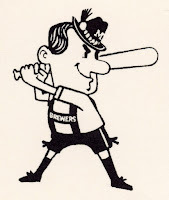 He owes a bit to the original version of Bernie Brewer (right), which was briefly used by the club in 1970. I can easily see this logo translated into a full-body version complete with lederhosen. The anonymous designer has also included a potential wordmark - "brewers" in curved, even, lower-case letters. 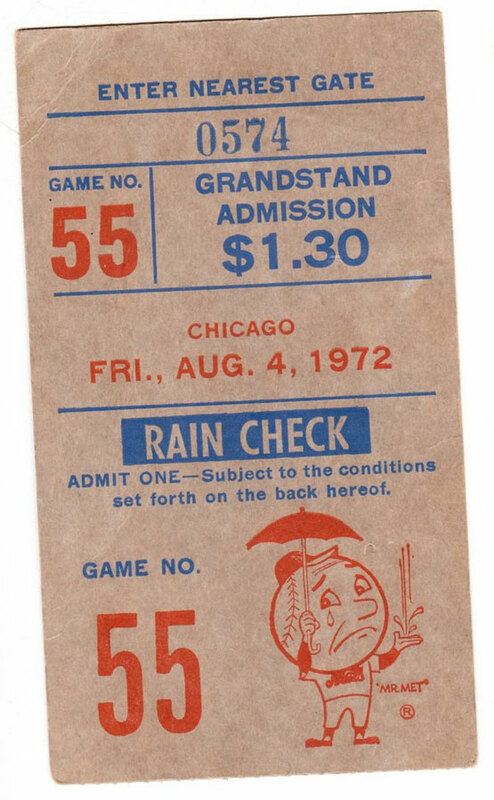 Again, very groovy '70s. 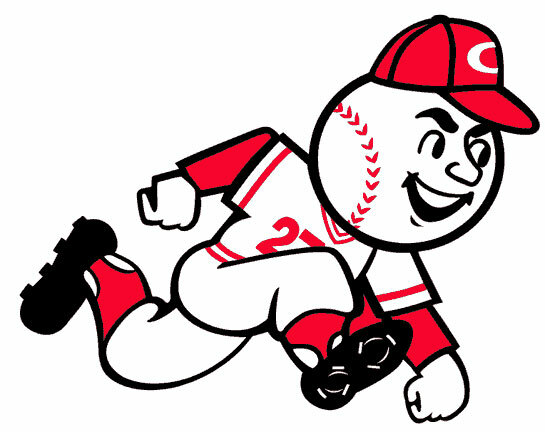 The second version has clear Beer Barrel Man ancestry. He's even facing the right direction. If Matthew is true, and these were contest entries or steps along the way to contest entries, it's a shame they were never developed. 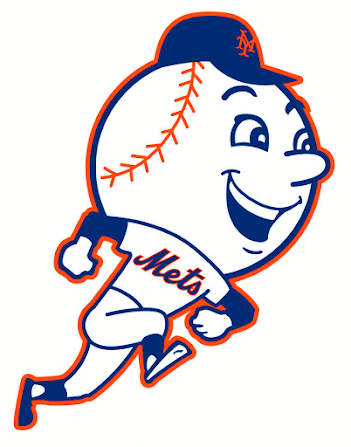 Mascot logos are the best, and not just because they lend themselves to grown-ups dressed in gloriously ridiculous foam suits. 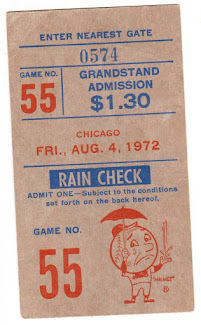 The applications are limitless, from special logos to seasonal applications to the unhappy Mr. Met Rain Check on this 1972 ticket stub. I guess I can't really complain; after a long time in the wilderness the Beer Barrel Man is back in force. And featured as a costumed character in Miller Park, a delightful development. But it's possible that he might not have had to go away at all in late 1977, only adapt into a slightly new form.